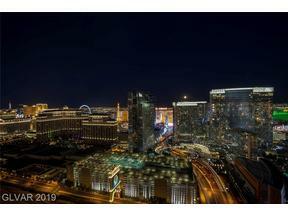 What High Rise Buildings are currently for Sale in Las Vegas? 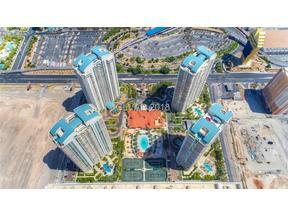 We currently have 18 High Rise Condo Towers in the Las Vegas area. Starting Downtown there are The Ogden, Newport Lofts and Soho Lofts. Moving South down Las Vegas Blvd. North strip high rise buildings in the zip codes of 89102 and 89109 include Allure, Sky LV, Turnberry Towers,Turnberry Place and Metropolis. Located in the Las Vegas Country Club there is Regency Towers and in the Hughes Center there is Park Towers. Located directly on Las Vegas Blvd, in the heart of the strip (zip code 89158) is MGM City Center – home to Veer Towers (East & West), The Mandarin Oriental & Vdara Hotel Condos. Along the Harmon Corridor otherwise known as Strip Adjacent in the 89103 zip code Just West of City Center on Dean Martin Dr. sit three beautiful blue glass towers. Panorama Towers and The Martin offer driver services and are just a short walk to City Center and “The Strip”. South on Las Vegas Blvd about 4 miles of Mandalay Bay sits One Las Vegas, two 20 story towers with amazing amenities. One Las Vegas “South Strip” Condos are in zip code 89123. 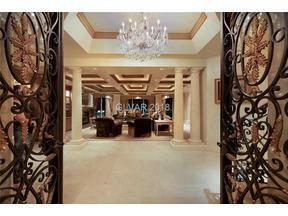 One Queensridge Place is just off Summerlin Pkwy. on Rampart and Alta Dr – the only high rise tower that is outside of the city is truly unique not only in location but style as well. What is the difference between Residential and Hotel-Condo? High Rise Residential Buildings are where Buyers own the interior space of the unit just like a Residential Condo in the Suburbs and are subject to HOA CC&R’s with restrictions on how often they can lease their unit and for how long. The majority of the buildings require a 6 month minimum lease, some require a 12 month minimum. In a Hotel-Condo type of project you purchase the unit which comes fully furnished just like a Hotel room would and you have the option of joining the Rental Program where the unit will be leased out on a nightly basis and the unit owner will receive a revenue check at the end of each month with their share of the total revenue created based on how many nights the unit was leased at the nightly rate which is determined by demand and occupancy. Where are the majority of these High Rise Towers located? The majority of the High Rise Towers are on or near the Las Vegas Strip with only One Queensridge Place on the west side of town in Summerlin. Paradise Avenue and Dean Martin Dr. run parallel to Las Vegas Blvd. and have a number of High Rise buildings located on these streets. All are in close proximity to the City except Queensridge and have easy access to the excitement of the Strip with it’s Fine Dining and Gaming options. What is The Harmon Corridor? The Harmon corridor is one of the most central and hip area’s in Las Vegas. Harmon Ave runs from Las Vegas Blvd. to Paradise Rd and includes the Signature MGM Grand Hotel-Condo’s as well as Veer Towers, The Mandarin Oriental, Vdara Hotel-Condo and also The Martin and Panorama Towers which are easily accessed by heading over the I-15 on Harmon Ave.
What are monthly dues like as far as HOA and utilities? Monthly HOA dues are ranging from approximately 50 cents to $1 a square foot. The lowest would be closer to 45 cents a square foot (One Las Vegas) and on the high side you would be paying upwards of 80 (Veer Towers) ( $1 psf/mo. for The Mandarin Oriental Residences), but the majority of the building are in the 55-65 cent range. Outside of monthly or quarterly HOA dues you will be responsible the Power/Electric the unit requires and whatever Cable/Internet service you choose to go with and the fee’s associated with that. Veer Towers is a Leed Certified Green Building and the utilities run very cheap. 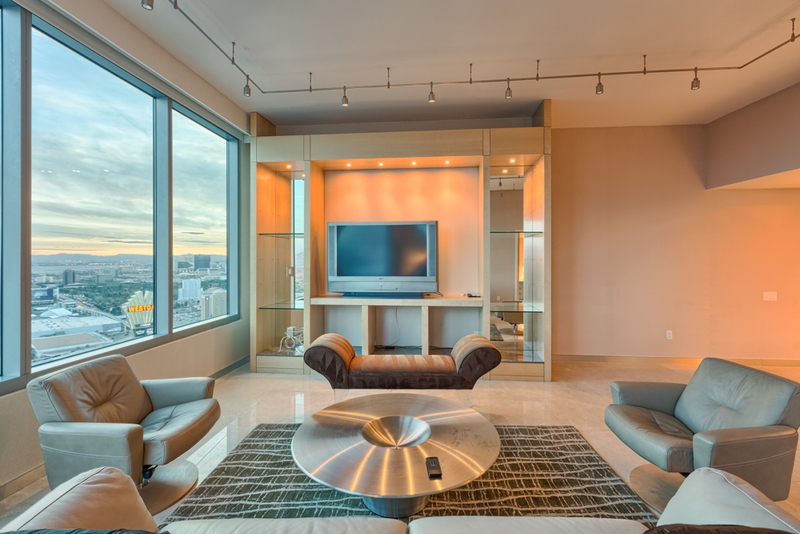 One Las Vegas, Martin & Panorama Towers HOA Dues all include access to basic cable and wi-fi. Hotel condos HOA dues run upwards of $1 psf due to elevator maintenance, common area maintenance, front desk, etc. What kind of Amenities do these buildings offer? Everything ranging from Pools and Exercise Facilities to In-House Theaters for the Residents exist from one High Rise to the next. All buildings have at minimum a Gym and an outdoor swimming pool and spa / hot tub. There are also area’s for pet’s to do their business and often an outdoor BBQ / eating space for enjoying the weather. Choosing the right Tower for an Buyer’s needs and individual taste will take into account what the building amenities entail. Queensridge Towers is extremely amenity rich with Roman Spas, Library, coffee/tea/smoothie lounge – it feels as if you are in a 5 star resort. Mandarin Oriental is also extremely amenity rich as you are living in a 5 star resort with access to maid service, room service, turn down service, etc. The residences are completely private and separate from the hotel. Are they safe / secure? Yes! Many of the high rise towers are guard gated, and the ones that are not there is always a staffed desk in the lobby where visitors must check in with Security / Concierge services before being allowed into the elevator core. The elevators are electronically FOB’d with access only to your floor which you live on and the floor on which the amenities exist. Most buildings have security that rove the floors and checks on residents if they need assistance. The parking garages are also secure and require a FOB upon entry as well as a Fob to gain access into the towers. With the exception of Veer Towers & Mandarin Oriental at MGM City Center all units in Residential High Rise buildings have an assigned parking space in the garage. Hotel condos are valet only, however you can keep a car in valet indefinitely. Some of the buildings have underground parking garage’s while others have a free standing structure that houses the residents parking spaces. Queensridge Towers is unique in that it has actual numbered garages within the covered parking garage! 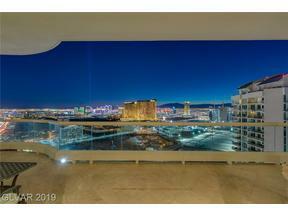 What is a major benefit of living in a High Rise Condo in Las Vegas? In a word I would say that convenience is the number one benefit of living in a High Rise Tower. The majority of people living in the High Rise Towers here in Las Vegas are doing so because they want to be close to the City and all it offers in Entertainment, Dining, Shopping and Gaming. Another benefit that relates to the convenience aspect would be the lifestyle that comes with living in the buildings – you have a Concierge at your disposal, a Security staff to keep you safe, onsite parking that is free of charge, and the amenities are very luxurious. Can you own a Pet in a High Rise? Yes. There are restrictions to quantity and weight. Do they all have Balconies / Patios? With the exception of Veer Towers, Mandarin Oriental, & Trump Towers, most of the high rise buildings have either a patio you can access or a sliding door that opens with a glass wall for your safety (this is referred to as a Juliette Balcony). What are the Rental restrictions? Can I do ARBNB? All of the Residential High Rise buildings have a Home Owners Association which governs the Rules and Restrictions that the unit owners must abide by. Sky Las Vegas & One Las Vegas will approve a minimum lease term of All the other towers require that a tenant sign a lease term of at least six months or more. ARBNB is not allowed as per HOA requirements in a Private Residential building as it would allow Owners to lease their units nightly/weekly and would be a disturbance to other unit owners who are residing full time as their primary residence. 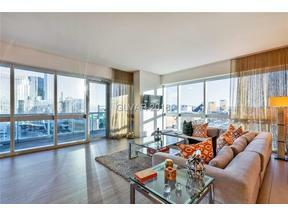 The Hotel Condos – MGM Signature, Trump Towers, Palms Place & Vdara have more flexible rental options. Do any Buildings Offer Driver Service? Panorama Towers, The Martin, & Turnberry Place all offer driver services. You simply call the concierge and book the time. They will take you to the airport, dinner reservations, shows, shopping, etc. It’s a GREAT benefit! What is close by where I can walk? The strip of course! Some buildings are closer than others – it depends on which building. The monorail is close by also to hop on and go to any of those drop off locations. Queensridge Towers near Summerlin is very close to Boca Park & Tivoli Village shopping/restaurants. The Stark Team has been selling high rise condos in Las Vegas since these buildings were in the pre-construction development phase. We were an integral part of selling Trump Towers, Sky Las Vegas, Panorama Towers, MGM CityCenter, Turnberry Towers, MGM Signature, One Queensridge Place, The Martin & More! Because of our in depth knowledge & involvement in selling these condos from paper, we know the buildings, floorplans, stacks, positioning & views extremely well. Our services are extremely valuable to both buyers and sellers due to our expertise when it comes to Las Vegas High Rise Condos. We look forward to helping you!